In the first nine months of 2018, Sony global recorded music revenues surpassed $2.87bn; that's to say up $158m, or 5.8%, on the same period of 2017. The figures come from Music Business Worldwide’s calculations based on Sony Corp’s newly-published results for its fiscal Q2 (calendar Q3), converted into USD at constant currency. As well as that 5.8% overall rise in revenues, streaming revenues were up $300.1m (+26%) year-on-year to $1.46bn during the Jan-Sept 2018 period. Physical revenues dropped $114.4m (-14.6%) to $669m in the nine-month period, while download sales dropped $58.8m (-16.6%) to $295m. 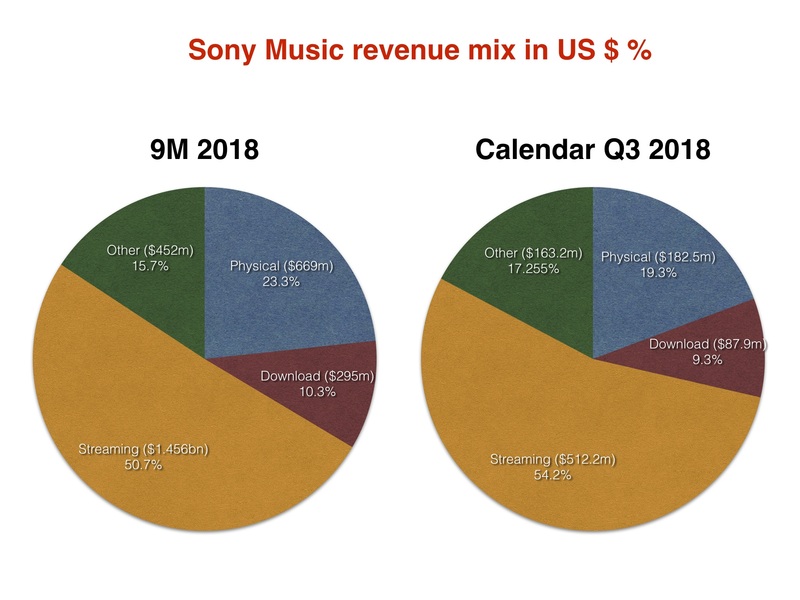 On the same USD constant currency basis, Sony’s recorded music revenues in the past quarter (to end of September 2018) fell slightly year-on-year, down 3.8% to $945.9m. That was partly due to an accounting adjustment made by the company versus 2017, and partly due to growth in streaming not quite offsetting double-digit declines in quarterly physical and download revenues.